Girls, I am so excited!! 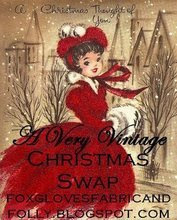 Heidi at Foxgloves, Fabric, and Folly is hosting a Christmas vintage swap. I've been reading about these swaps for awhile now and always think it sounds like fun. Well, I decided to jump in and join the festivities. OOO, my gosh....this sounds like so much fun. I am beginning to get excited about Christmas already! Funny you should mention 'stalking' your favorite house...I have a post coming up soon about the house that I stalk every day!! Do we all have a house that we are in love with?? Probably!